Continue reading"Turning Up for Yom Yerushaliem"
Last Sunday Carmel School hosted an art exhibition for The Really Useful Recyclers. The Really Useful Recyclers make paper art from mainly recycled paper. They produce various artworks, comprising different themes which are truly amazing and inspiring, not just because of the ingenuity or hard work invested into the design and production process. What makes this art so special is the two young men behind The Really Useful Recyclers, Josh Flintoff and Courtney Smith. There journey in life is different to most of us as they deal with the effects of Autism on a daily basis. Things we take for granted are more difficult, a challenge for us becomes a huge obstacle to achievement in their every day lives. Despite the odds being stacked against Josh and Courtney them, together with their two mothers Deb and Del they created a programme to recycle paper into paper art. The results were on display last Sunday at Carmel School where a huge collection of art works was displayed to the many visitors from all over Perth. The amount of support from the wider Perth community dwarfed, the Jewish community representation. Most of the art was sold to an enthusiastic crowd who continued to roll in throughout the day, long after the formalities were over at the VIP morning tea. 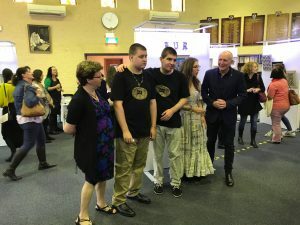 The support from various politicians was highly appreciated with the Hon Stephen Dawson MLC, Minister for Environment and Disability Services attending as well as Simon Millman MLA, Member for Mount Lawley. olunteers and helpers, dreams became reality. Top marks to the school for backing their students and showing them the right path in our community. Its great to see the school nurturing talented students who can organise and inspire others for good purposes. For more information on the The Really Useful Recyclers visit their Facebook Page.